Stella week on the Tongariro. Hi guys, Sorry about the lack of reports this week but I have been really busy on the river everyday and feeling pretty tired at the end of most nights. 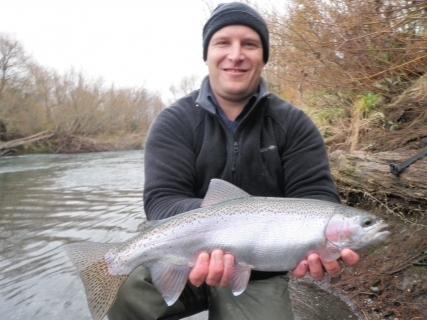 Being on the river all week I am pleased to say that it has been nothing short than fantastic fishing and I have seen some of the best fish come out that I have seen for quiteÂ a while. IÂ know you all read Â different blogs from different areas and get the general idea of whats been happening on the Taupo rivers from different sources but god you must all be confused at the moment when we all say different things. I’m not to sure what has been going on in the smaller rivers about Taupo but the Tongariro has been on fire and if you know where to go and how to fish it then you will also be experiencing great sport. I have had some fantastic clients this week from Australia which were really keen fisherman andI have found myself on the water at 6 30 am most mornings waiting for it to be light enough to secure your favourite possie and see the indicator. With heavy angler pressure on the rivers at the moment this has definitely helped us in catching some of the best fish this week. Fishing first lines in a pool which I know will always hold fish at this time of year has resulted in hook ups every morning in the first 2 casts and sometimes 1st, 2nd and 3rd. AsÂ a guide it is worth getting up at that time of the morning and getting those first few fish out of the way as it makes for a excellent vibe for the rest of the day between everyone. 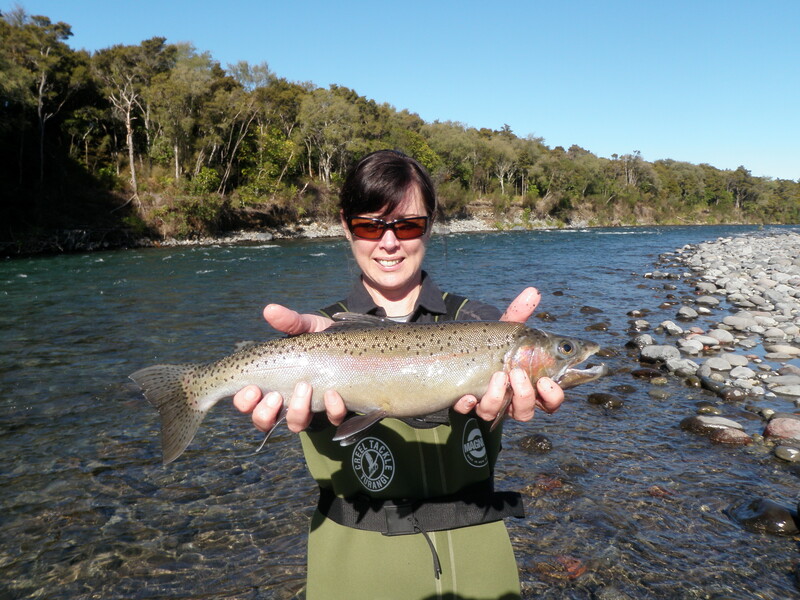 I must admit we have hit it perfect this week and I was surprised to see so many fish running the Tongariro without rain or a cold snap but as usual it is justÂ a matter of being in the right place at the right time and finding some trout with their mouths open. With the runs getting latter and latter every year we have to expect fish to eventually move in with or without the rain as the urge to spawn gets too much. Hen fish caught this week have been really , really fat with ripe eggs and in awesome condition so when they get to that stage they will just move in regardless of the water conditions. As usual some anglers have struggled and not everyone have been carrying good fish but fishing is fishing and it would be boring if we slayed them every week-good for me but boring! My old man is over here at the moment and has been doing it fairly hard in the Tongariro over the last couple of weeks but hit a great patch of fish in the lower river and about the braids and had 20 on the bank on Wednesday. Excited and surprised he thought he would do it again the next day and fished all over the river for 8 hours only to encounter 1 trout the entire day-how does that work?? Once again fishing is fishing and that’s just how it goesÂ these days. I know many anglers are again disappointed with the season and I have had some bloody tough guided days over the past couple of months but I have also had some of the most rewarding days guiding with great fish since I started guiding. I am in agreeance with many other guides and fishermanÂ when they comment on how fast fish are moving through our rivers which is making getting good sport hard unless you’ re on the spot as they move through. I think we could argue all night about this one andstill not come up with something set in stone as we will never really understand nature and probably will never be able to really dictate it. I do believe that fish are spending more time in the lake and enjoying the deep, cold conditions while the rivers are generally warmerÂ and lower carrying less water than they used to due to rainfall and maybe hydro power. Anyway I’m sure everyone has different views on whats happening with our trout and I would think that all theory’s have some truth behind them but at the end of the day we still have a great resource which we just need to respect and enjoy. I’m still buzzing about this week so you better listen closely and enjoy the pictures of some fantastic fish. We spent most of the week in the lower reaches below the main road bridge and even on one occasion ended up down at Delatours intercepting very fresh fish which were trickling through while moving up. First light was by far the best time to be on the river and 90 % of fish were caught before 10 o clock in the first couple of holes we fished down river. The lower river has heaps of water to explore but only a few really good snag free drifts so if you want to be involved in these it pays to get out of bed and head down early. While fishing these pools it really pays to drop your flies in the deep runs quickly otherwise you wont be fishing deep enough resulting in less hook ups. Matt loved casting a 5mm Tungsten bead and 2 AAA split shot above it which is really weird as most guys cringe at the thought. ItÂ was necessary to use this method as the hole had heaps of trout in it and you jut had to get that big glo bug down past the swirly drift to encourage a strike. I’m glad Matt had his own rod as I don’t think I would like that lot hitting my rod as they tend to fracture when struck with bombs and split shot. Someone must remind me that next I guide MattÂ I should invest inÂ a crash helmet so I don’t end up with a cracked skull. First thing in the morning we have been using large glo bugs in varying colours but as the sun gets up andthe morning passes we have changed to naturals such as white caddis or PT variants with rubber legs (love rubber legs). I spoke to a couple of wet liners who were also doing well at Small mans Reach wet lining Woolly buggers and large Glo bugs. This style of wet lining Glo bugs is new to me but when I think about it there is no reason why it should not work as quite oftenÂ I pick fish up at the end ofÂ Â a drift while nymphing. We spent most of the afternoons exploring the upper river with little success so I’m not to sure where these fish disappear to after passing the bridge (are they passing the bridge?) maybe they are that fat with eggs the are dropping down low and heading back to the lake!Â Â TRM anglers did quite well in the Blue pool area with some anglers hitting up to ten fish up there so it just shows they are there you just have to be able to catch them. Vic from chicago is one of those anglers which fish don’t get passed and he managed to get stuck into a great brown which weighed in well at 5lb using some secret created by the man himself. I will be guiding Vic this week so I will once again rob his fly box andadd it to my arsenal. My fly box must have a thousand flies in it but stillÂ I end up using just 2 or 3 patterns which is short sighted of me really and I should explore the possibilities of finding something new. Angling pressure was not to bad on Thursday afternoon and Matt and Bruce managed to get the Stag and the Cicada pool to themselves, Â this is where Matt caught the best fish of the trip andthe hardest fighting fish he has ever experienced. 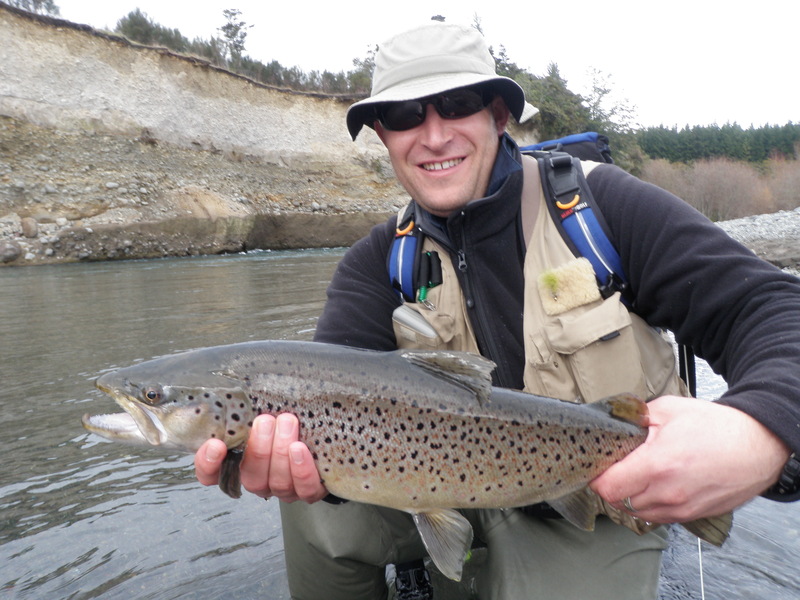 This great conditioned Brown was caught in the Cicada pool on the far side using a small white caddis attached to 6 lb flurocarbon. This poolÂ is slowly starting to get a real reputation for holding awesome browns and with a careful approach they can be fooled quite easily in here. The Tongariro seems to have had another run of smaller browns which is great news for the up and coming comp against the Waytahanuie, we just got to stop catching them this week. Another busy weekend is ahead with guiding so will probably be away from the computer for a few more days which will result in not any reports getting done. Please keep reading, as soon as I quieten down I will be back on it most nights keeping you in the loop the best I can. I really hope this report has restored enthusiasm in all of you and has spurred you into arranging a trip up with your mates to try your luck.